In this section, we will go over the setup and configuration required to enable our computer to run a simple Node application using TypeScript. This step is only necessary if you do not already have Node installed on your machine. If you do feel free to skip. You will need curl installed on your machine to run the first command. Curl is a command-line tool for transferring data using various protocols. If you are on a different operating system, head over here for Node installation instructions. At the time of writing this article, the stable versions for Node and Npm are 10.15.1 and 6.7.0 respectively. The -D flag is the shortcut for: --save-dev. You can learn more about this here. The second command above installs the Express types. We need this package because TypeScript and Express are independent packages hence there is no way for TypeScript to know about the types of Express classes. Types in TypeScript are files, normally with an extension of .d.ts*, used to provide type information about an API, in our case Express. module : Specifies the module code generation method. Node uses commonjs. target: Specifies the output language level. moduleResolution: This helps the compiler figure out what an import refers to. The Valuenode mimics the Node module resolution mechanism. outDir: This is the location to output .js files after transpilation. We save it as dist. ProTip: An alternative to manually creating and populating the tsconfig.json file is running: tsc --init. This command will generate a nicely commented tsconfig.json file. To learn more about the key value options available, check out the official TypeScript documentation. By default, the Typescript linter prevents the use of our favorite debugger, console, hence the need to explicitly tell the linter to revoke its default no-console rule. At this point in the tutorial, we can either directly run functions in the terminal or create an &apos;npm script&apos; to neatly run them for us. Let’s go with the latter, we will make a “start” script that compiles and transpiles the TypeScript code, then runs the resulting .js application. In the snippet above, we updated the main path and added the start command to the &apos;npm scripts.&apos; Taking a close look at the start command, we are first running the tsc command and then the node command. This will enable us to compile and run the generated output with node. NOTE: The tsc command tells TypeScript to compile the application and place the generated .js output in the specified outDir directory as it is set in the tsconfig.json file. 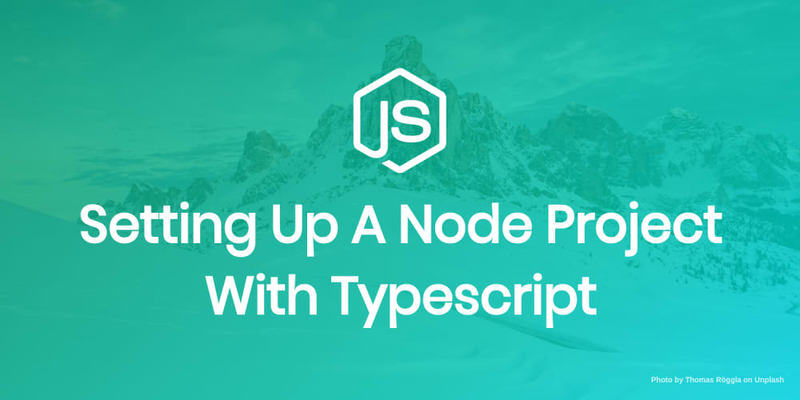 Awesome, you have successsfully set up your Node project to use TypeScript! Finally, we followed simple steps and learnt how to set up a Node project with TypeScript.